Unique ball design allows for higher flow capacities. Perfect for tank selection on larger vessels. .. 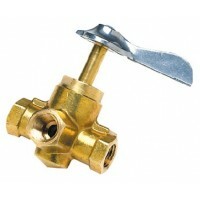 Bronze fuel shut-off 1/2 A: 0.50"Size: 1/2" NPTB: 1.12"C: 2.25"D: 1.78"E: 3.87".. 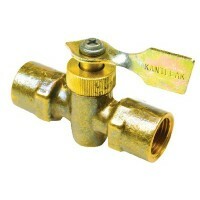 Bronze fuel shut-off 1/4 A: 0.43"Size: 1/4" NPTB: 1.12"C: 2.25"D: 1.78"E: 3.87".. 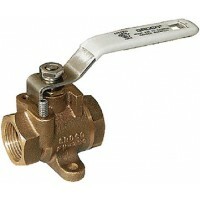 Bronze fuel shut-off 3/4 A: .68"Size: 3/4" NPTB: 1.50"C: 3"D: 2.12"E: 4.87".. Bronze fuel shut-off 3/8 A: 0.50"Size: 3/8" NPTB: 1.12"C: 2.25"D: 1.78"E: 3.87"..
4-way 1/2 full flo selector Size: 1/2"..
Six-port fuel valves are used where 2 tanks supply a single engine, and a return to each supply tank..
TS-350-T Tank Selector Kit utilizes FV-450-X full flow valve mounted on a stainless steel mount brac..
Fuel system valves must have an independent means of support. These full-flow valves meet all requir..
1/2in npt 90-degree fuel valve Size: 1/2"..
Valve- 4-way brass 1/4in fnpt Thread: 1/4" FNPT..
Valve-shut-off br mf1/4infnpt Thread: 1/4" FNPTDescription: Male/Female..
1/4in female/male brass shut-o Thread: 1/4" FNPTDescription: Female/Female..
Valve- 3-way brass 1/4in fnpt Thread: 1/4" FNPT..
Valve-3way click br 1/4in fnpt Thread: 1/4" FNPT (click valve)..
Valve- shut-off br 1/4x1/4npt Size: 3/8" Barb x 1/4" NPT..
Fuel valve-2way-1/4 x 1/4 feml Size: 1/4" x 1/4" NPT (Female Ports)..
Fuel valv-2way-1/4x1/4 male/fm Size: 1/4" x 1/4" NPT (Male/Female Ports)..
Fuel valve-2way-3/8 x 3/8 fml Size: 3/8" x 3/8" NPT (Female Ports)..
Fuel line valve-3 way 1/4 Size: 1/4" x 1/4" x 1/4" NPT..
Fuel line valve-3 way- 3/8 Size: 3/8" x 3/8" x 3/8" NPT.. Valve 3-way w-dentent 1/4 fnpt Thread: 1/4" FNPTDescription: w/ Detent.. Valve 3-way w-dentent 3/8 fnpt Thread: 3/8" FNPTDescription: w/ Detent.. Valve 3-way 1/4 fnpt Thread: 1/4" FNPTDescription: w/o Detent.. Valve 4-way 1/4 fnpt Thread: 1/4" FNPTDescription: w/o Detent.. Valve shut-off f-f 1/4 fnpt Thread: 1/4" FNPTDescription: Female/Female.. Valve shut-off m-f 1/4 fnpt Thread: 1/4" MNPT / 1/4" FNPTDescription: Male/Female.. Valve shut-off m-m 1/4 fnpt Thread: 1/4" MNPTDescription: Male/Male..